In a report released earlier this week, Global Witness claims that multinational companies are furthering a trade in minerals at the heart of the hi-tech industry that feeds the horrendous civil war in the Democratic Republic of Congo (DRC). (Global Witness is the same nongovernmental organization that helped expose the violence that plagues many of the sources of diamonds.) However, the accused companies, with varying degrees of hostility, deny any culpability, saying Global Witness oversimplifies a complex economic process in a chaotic geopolitial setting. By the time metals reach electronics companies, they may have changed hands as many as seven times. This means that without a clear supply history, when a consumer sets her cell phone to vibrate, a function enabled through the mineral wolframite, it is virtually impossible for her to know whether she is using wolframite mined in the eastern DRC, the site of horrific fighting and killing. More than 5 million people have been killed since the conflict began in 1996, some through direct abuse, others through the political and economic chaos that the conflict has created. Armed groups frequently force civilians to mine the minerals, extorting taxes and refusing to pay wages. 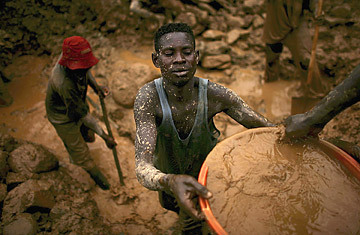 The report quotes one miner from South Kivu: "We are their meat, their animals. We have nothing to say." The study, Faced with a Gun, What Can You Do?, raises questions about the involvement of nearly 240 companies spanning the mineral, metal and technology industries. It specifically fingers four main European and Asian companies as open buyers in this trade: Thailand Smelting and Refining Corp. (owned by British Amalgamated Metal Corp.), British Afrimex, Belgian Trademet and Traxys. And it questions the role of others further down the manufacturing chain, including prominent electronics companies Hewlett-Packard, Nokia, Dell and Motorola. Even though the companies may be acting legally, Global Witness criticizes their lack of due diligence and transparency standards at every level of their supply chain. British Amalgamated Metal Corp. (AMC) firmly denies the accusations, citing its standing objective to improve visibility so that warring parties do not benefit from trade. "We are disappointed with the number of inaccuracies and omissions in the report and are concerned that all the facts should be properly represented in a balanced way," AMC said. The company statement went on to say, "We are concerned that Global Witness' approach will lead to a de facto ban on the trade which we do not believe is in either the short term or the long term interests of the Congo either economically, politically or socially." Traxys CEO Mark Kristoff told TIME that his company suspended trade in the DRC in May 2009 until there is a clearer road map for cooperation among companies, the U.N. and governments for a plan of social action. He added that Traxys' $50 million in trade in the DRC is equivalent to 1% of the company's total business. Afrimex told TIME via e-mail that its last shipment from the DRC took place in September 2008 and all such transactions have since ceased. "Any link between Afrimex's past mineral-trading and armed groups remain wholly unfounded," the statement said. "We remain at a loss to understand why Afrimex is still being mentioned by Global Witness." Global Witness spokesperson Amy Barry said, "Just because they have claimed to stop sourcing at this point doesn't change the fact that they were sourcing during our research. So we still think that the evidence we uncovered is worth bringing to the public's attention." Other companies were less confrontational. In a statement, Hewlett-Packard said, "We are helping to address this serious concern through voluntary measures. Ensuring that electronics manufacturing does not contribute to human-rights violations in the DRC takes co-operation and commitment within every layer of the supply base." Some of the companies named in the report defend their business in the DRC by noting that their practices abide by the Electronic Industry Code of Conduct or the ethical principles of the International Tin Research Institute. Global Witness calls for higher standards in these industry guidelines to successfully monitor trade systems in conflict areas. "I don't think there's an obvious or easy answer" to the supply-chain problem, says Global Witness spokesperson Barry. "We are absolutely not calling for companies to pull out because we acknowledge it is a legitimate source of livelihood." The group's chief Congo researcher, Carina Tertsakian, puts it this way: "This is a question of will. If the companies are serious about trading in a way that is clean, they have the means to do it."